There are some great full featured networking packages like Nagios  and MRTG  that can be installed on the Raspberry Pi. If, however, you are looking for something smaller to play with, then Node-Red might be the answer. Node-Red is a visual programming environment that allows you to create applications by dragging and dropping blocks (nodes) on the screen. Logic flows are then created by connecting wires between the different blocks (nodes). 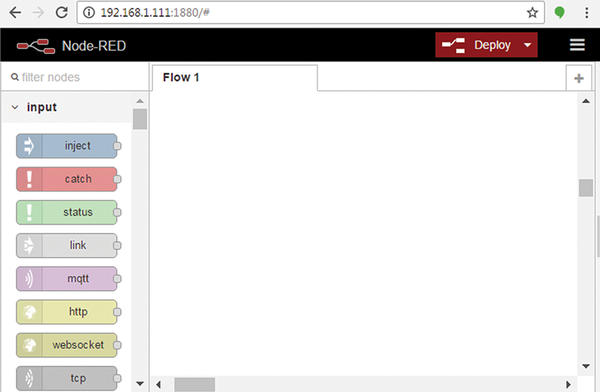 Node-Red also comes with Web Dashboards that allows you to view data or control the app from your smart phone. In this article we will look at creating some smart phone dashboards that will monitor PCs and control Pi GPIO devices (Figure 1). 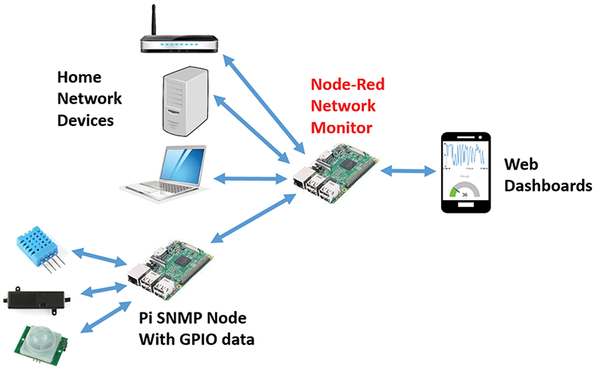 Figure 1: Node-Red smart phone network monitoring. Simple Network Management Protocol (SNMP)  is the standard for communicating and monitoring of network devices. Common device information is grouped into MIBs, or Management Information Bases. Data items are called OIDs, or Object Identifiers. OIDs are referenced by either their MIB name or by their OID numeric name. So for example the SNMP device name object could be queried by either its MIB name of SNMPv2-MIB::sysName.0 or the object identifier number of: .1.3.6.1.2.1.1.5.0. There are a number of useful SNMP command line programs you can use. Table 1 lists a few. If SNMP is working correctly you will see a very long list of SNMP objects (see Listing 1). Node-Red has been pre-installed on Raspbian Jessie since November 2015. The base Node-Red installation includes support for the Pi's GPIOs. See the Node-Red website  for a full list of available libraries and installation directions. To load the SNMP, Web Dashboards, and timer libraries enter the commands shown in Listing 2. Once Node-RED starts, you use a web browser to build applications. If you are working directly on your Pi, enter 127.0.0.1:1880 in the URL address box of your browser. Figure 2 shows the Node-RED development environment. Drop palettes from the left pane into the large flow window in the middle and wire them together in the correct order. Clicking the Deploy button in the upper right starts your program. Figure 2: The Node-Red development environment.